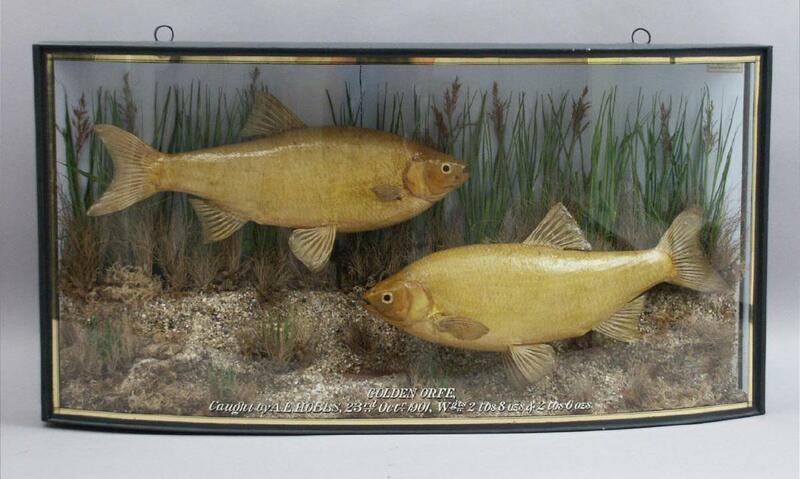 Two preserved and cased Golden Orfe fish, caught by AE Hobbs in the River Thames on the 23rd October 1901. Weights 2 lbs 8oz and 2lbs 6 oz. Hobbs was born in New Street, Henley in 1871 and lived in Henley all his life. Whilst working as an architect for Brakspear brewery in the 1930's he was responsible for designing many local pubs. Hobbs claimed to have caught almost 900 Thames Trout, each over 3 lbs in weight, in 55 years of fishing. He fished in the non-tidal reaches of the Thames.